Katie’s trying to get an amateur circus act going because the circus is offering a big cash prize for the best one. She should stick to doing what happens to her all the time – getting into all sorts of oafish scrapes – because it makes her a natural clown. Which is of course what gets her the prize in the end. Wouldn’t you know it – the lead part in Barbie’s new ballet requires the lead to dance like a blind girl! If only they knew they had a real “Blind Ballerina”. 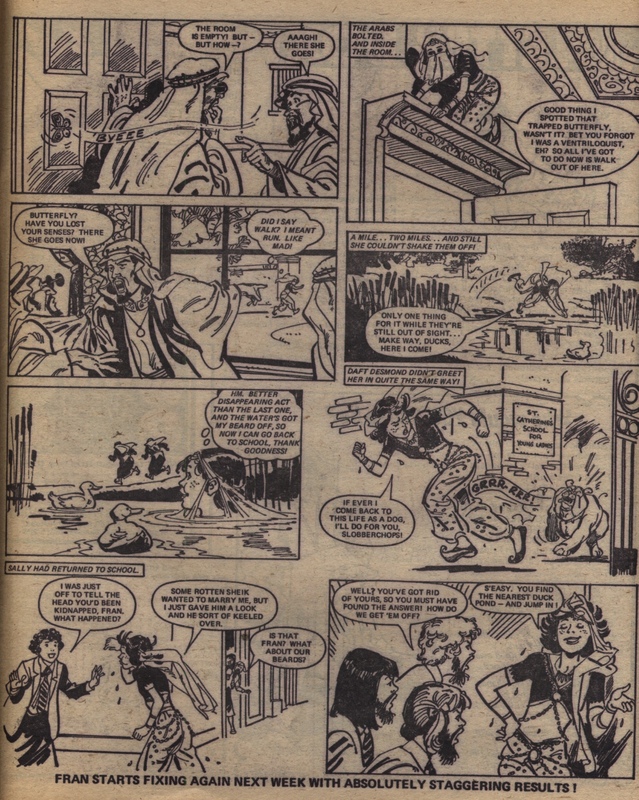 Merry succeeds in alerting the gypsies to Miss Ball and the Warden, who are out to burn their camp down – and the gypsies give the two misery-makers a jolly good soaking into the bargain (the panels of it are in the panel gallery). Hilda is now safe in the medical care of the gypsies. Then, it looks like Jessie the gypsy girl has broken into the reformatory once too often. Miss Ball is about to make a grab on her! Ma Siddons lumbers Dora with the job of flag day seller for the Down and Out Dogs League – and then the rotten cheat steals the credit for all the money collected when the organiser returns for it. Occasionally Dora does not score a total victory over Ma Siddons, and this is one of those times. Debbie passes the test in obtaining the mug from the poetry reading competition – not because she won but because the winner thought she deserved it more. Unfortunately Debbie’s nasty cousin Elaine is getting hotter on the trail, to the point where she tries to follow Debbie into the Valley of Shining Mist. Cinderella Smith has to disguise herself to keep her secret from her nasty cousins – who have turned up to watch her first fashion show! Nasty Mr Blackburn and Miss Berridge are so suspicious of Julie now that they’ve had her grounded at home and escorted to and from school until she tells them what she’s up to. Of course Julie can’t tell them about the “Green People”. At least she has a new pendant to contact them with, so that should help. The evacuees run off in London in search of their mother after a huge air raid bombing. “Daddy’s Darling” goes to London to search for them – something her father hasn’t bothered to do. Flo’s finding it difficult to keep in touch with Greg this week because his nasty manager and mobs of fans keep coming between them. Could her misgivings about him becoming a pop star be right? Katie’s teacher Miss Dean has excluded her from a visit to a VIP’s houseboat – only to discover she is a jinx herself and aggravating the very VIP she wanted to impress. Not to be outdone, here comes Katie the Jinx herself in a souped-up motorboat she was given by mistake. Blind Ballerina creates more problems for herself this week because she just won’t explain that she is blind after it got Daisy taken from her. And as if that wasn’t enough, Barbie’s jealous rival Sylvia is getting suspicious. Merry’s call to the children’s welfare officer pays off and saves Barry from being forced into handing over his farm to his horrible stepfather. The stepfather then gets an uproarious send-off and won’t be back. Unfortunately the call does not save Merry and Co, who get carted back to Misery House, because Barry didn’t get the name of the reformatory! Oh well, perhaps a seed has been sown that will sprout into something later on. Meanwhile, it was too close for comfort for Miss Ball and the Warden, so they are not going to risk any more of those deals. Well, that’s something. However, we now know how corrupt they really are, so what else will they get up to? And would it have anything to do with exposing Misery House, which Merry has been trying to do all along? Dora is sent to collect a dog named Tiny. Now why is it that when an animal is called Tiny, it always turns out to be enormous? As it turns out, there was a tiny mixup; Dora received the wrong dog and Tiny really is tiny after all. Cinderella Smith’s got her modelling contract, but there’s a snag – she needs to get her nasty cousins to sign as they are her legal guardians. Cindy’s trying to stuff them with so much food they will be in a state to sign without reading the document. We will have to wait until next week to see if Cindy’s trick works. Debbie’s going to dangerous lengths to return the brush she stole to the Valley of Shining Mist after spiteful Elaine throws it down a collapsed mine. Now Debbie has to risk life and limb to retrieve it. In the end it’s worth it because the Valley opens up for her again. But after that hairbrush incident, Debbie’s horrible relatives now suspect she’s up to something. And there is a blooper here: Debbie hurts her left knee while climbing down the mine – but in one panel the injury appears on her right knee. Workers on the new motorway are surprised to find emeralds Julie planted, courtesy of the Green People. As hoped, it has put work on hold. Unfortunately, Julie’s brother is about to do some investigating after the enemy teacher, Miss Berridge, sees the entrance to the world of the Green People. Daddy hires a new maid, Mrs Watkins, but only because she was the only applicant. Personally, Mrs Watkins does not meet his snobby approval – which means she gets on famously with his darling and the evacuees! Snobbery now seems to be coming between Greg and Flo too. Greg wants his sister to start enjoying the high living as the sister of a pop star, but the humbler life the twins used to lead has rubbed off on her. And she still feels uneasy about Greg pursuing a career as a pop star. This week’s issue advertises the second issue of Lindy and her second free gift: Lindy’s favourite perfume. Wonder what scent it was? The cover image on this issue is a memorable one – Mistyfan says it has stuck with her for years, since she first saw it. The colours are vivid and the picture of Fran as an Arabian ravin’ beauty could hardly be bettered! Poor Cherry is skivvying away – and to my mind, taking a back seat to dressed-up Fran, to boot. Tina is finding out how the world that Salina landed her in differs from her own. Is it only this sorceress (or rather, Professor Salina PhD, Head of Sorcery Department at Benford University) who has mysterious powers? That’s what Tina persuades herself of, and with Salina out of sight, she thinks she has no very strong motive to mend her selfish ways. Cue complaints about her parallel universe parents’ cooking, and a forceful demand to have all the clothes and knick-knacks that she is used to back in her own world. At the start of the week, Tina is looking forward to starting school and showing everyone how much better she is than everyone else – but she is in for some nasty surprises, because everyone else is surprised ‘that new girl didn’t use any magic against Lindy when Lindy was swimming!’. What will she come up against in the next episode? Dorrie and Max in “Somewhere Over The Rainbow” are stuck on a train that is blocked by snow – they entertain the passengers while the train is stopped, and earn their passage that way. The weather is against them as they continue their journey, and it is difficult to find shelter anywhere. Cherry is being abused both emotionally and now physically – none of her family have thanked her for stepping in so successfully when her cousin wasn’t there for the play, and when a nosy parker Child Welfare officer starts asking questions, the family do a quick bunk. The aunt even slaps Cherry when she asks why they’re ‘rushing off like crooks’ and the smooth-talking uncle says ‘Your aunt didn’t mean to hurt you. She often lands our two a crack… forgot you weren’t one of our brood, y’see! Beginning to think of you as real family.’ What a lot of charmers! “Wild Rose” hears the story of the mysterious gypsy lady – who turns out to be not her long-lost mother, but the mother of Susanne, the girl that Lady Vere thinks is her own daughter! How will this tangle be cleared up? Next week we are promised the ending of this story, so we will find out soon. Alley Cat is a light-hearted, light-weight gag strip that we don’t typically describe in these story posts. We have found out, via the Great News For All Readers blog, that the artist to credit is Rob Lee, so we will be indicating that from now on. Shona is worried that she will soon die ‘on a planet millions of miles from home… and alone’! She has been rescued from the cruel circus but left in the harsh outlands and abandoned by the two-headed goat that has befriended her. Soon her friend returns, though, along with a whole herd – who cluster around her and warm her up. The herd leads her to another part of the outlands, where she can contact people who look human, like her. What will she find, once she makes that contact? A couple of issues ago Cinderella Smith received instructions on how to make a cute cloth tortoise, which she used to make a birthday present. Perhaps Jinty is now sharing the instructions, because this week’s craft feature is how to make a cloth tortoise, which can be used to keep your things tidy. Speaking of Cinderella Smith, she starts her career as a model this week, and it all has to be done behind her cruel cousins’ backs. This presents a problem when Cindy realises she has to get her cousins’ signatures for the modelling contract, and she knows they won’t sign voluntarily. Katie’s teacher hopes she’s not always a disaster when there’s water around because she wants to butter up a school governor so the school will get permission to use his houseboat. Fat chance. The episode ends with Katie on a runaway motorboat that is too powerful for her to handle! Things look up for Barbie as she acquires a guide dog and a job at a ballet company. It looks like a chance to advance her love of ballet at last – but the episode ends with Barbie in danger of falling down the stairs. Moreover, the obligatory jealous rival of the piece has now started her nasty scheming against Barbie. The Valley of Shining Mist won’t take Debbie in this time and she knows it is because she stole a silver hairbrush from there. However, Debbie’s nasty relatives are trying to stop her efforts to return it. So Debbie is finding she has to acquire some lessons in backbone as well as honesty. Julie’s campaign to stop Mr Blackburn’s motorway and save the Green People, is going ahead and looking strong. Unfortunately it has cost his brother his job. Furthermore, there is a new enemy in the form of Julie’s teacher, Miss Berridge, who happens to be a cousin of the Blackburns. For a brief moment it looks like Daddy’s heart has melted towards the two evacuees. However, he hardens up again to the point where he won’t allow their mother to visit because he doesn’t want his darling to catch any germs from her. That man is just impossible. Is there nothing that can get through to him? In this week’s “Dora Dogsbody” there is a mishap with hair-restorer lotion that causes a dachshund to grow long hair! They have to keep Ma Siddons from finding out. This week it looks like Greg and Flo will be reconciled. Then a television producer discovers the shabby flat Flo has been staying in and blames Greg for the state his sister has been reduced to. Are the twins set on a collision course again? 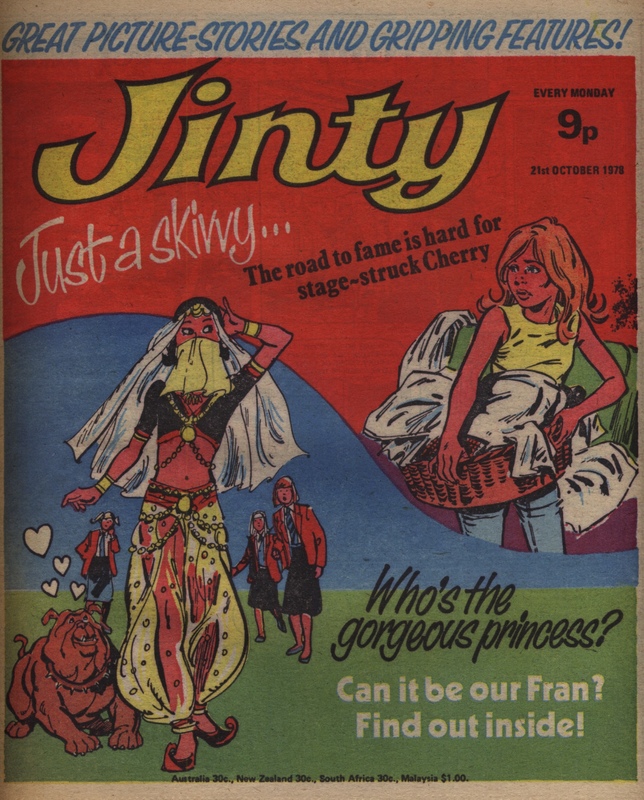 This is the advertisement for the first Lindy issue, from Jinty 14 June 1975. The ad entices readers more with a Bay City Rollers pin-up than the story contents. Only the cover gives any indication of what stories to expect. 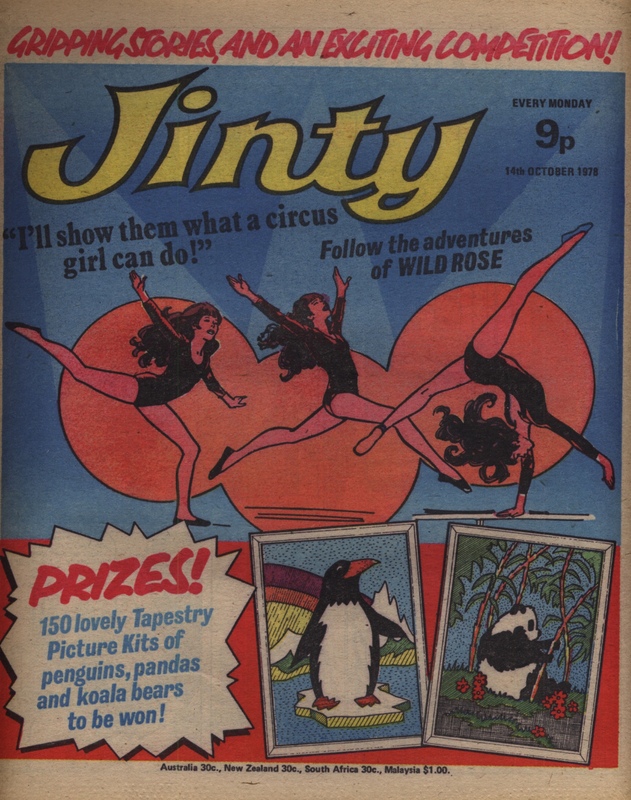 Lindy was a short-lived title and merged into Jinty after only 20 issues. She was the first of two comics to merge with Jinty. Katie the Jinx breaks the school goldfish bowl (she would) and has to replace it. Trouble is, she’s broke and has to use her brains to find a replacement – while going through her usual scrapes, of course. Ana Rodriguez had quite a track record in drawing ballet stories, and now she’s illustrating “Blind Ballerina”. Our blind ballerina has a very bad run this week, and it’s only part two of her story. She’s had a road accident, can’t find her sister Daisy, her blindness leads to disaster at her new circus job, and the circus boss has turned so nasty that he’s threatening to set a dog on her. “Merry at Misery House” and her friends find the mean farmer is abusing his stepson Barry as much as he is abusing them, and is trying to force Barry to sign over the farm to him. Merry and Co step in to help, and also take an opportunity to phone a children’s welfare officer about Misery House. So will there be help at last for the abused inmates? Or will their enemies foil them again, as they have so many times before? Cinderella Smith’s off to the ball – er, friend Susie’s birthday party – this week. It turns out better than expected when Susie’s Dad spots how photogenic she looks in the party photos and wants to sign her up with a modelling contract. Wow, Prince Charming already! Unfortunately, Cindy’s still in the clutches of those abusive cousins and we can be certain they will do everything they can to stop her. Debbie comes back from the Valley of Shining Mist with a new ambition to take up violin – and a silver hairbrush she’s stolen from the Valley. Her abusive family notice both the hairbrush and the new violin Debbie buys and are not impressed. Their abuse drives Debbie to run off. But will the Valley emerge from the ruins it dissolved into earlier and take her in again? The dogs’ hotel is taking in Susi Sparkle, a famous pop star dog this week. The dog is not top of the pops with Ma Siddons after she breaks Ma Siddons’ new colour TV, pinches the food (in her sleep), and causes Ma Siddons to get a black eye! This week Flo turns pop star herself. Greg won’t perform at a charity show at the children’s hospital – too much under the influence of his mean-looking manager. So Flo dresses up as Greg and performs in his place. Unfortunately Flo did not count on a newspaper photographer being there, and it’s all going to be all on the front page tomorrow! What’s Greg going to say when he finds out his estranged sister has been impersonating him? The evacuee children liven things up for Lee when they help her get rid of the old dragon of a tutor that Daddy hired for her. However, Daddy gets even worse than usual when the anniversary of his wife’s death approaches, and takes it out on the poor evacuees. Julie’s efforts to help the Green People unwittingly get her brother Chris into trouble; the company thinks he’s been leaking information about the new motorway. The Green People soon tell Julie the real reason why the company wanted it kept top secret – people will protest against it. Which is precisely what they do after the Green People discreetly spread the word around – telepathically! The issue also advertises the first issue of Lindy, which is out next Saturday. The free gift is a charm bracelet. The ad doesn’t entice you with descriptions of the stories. 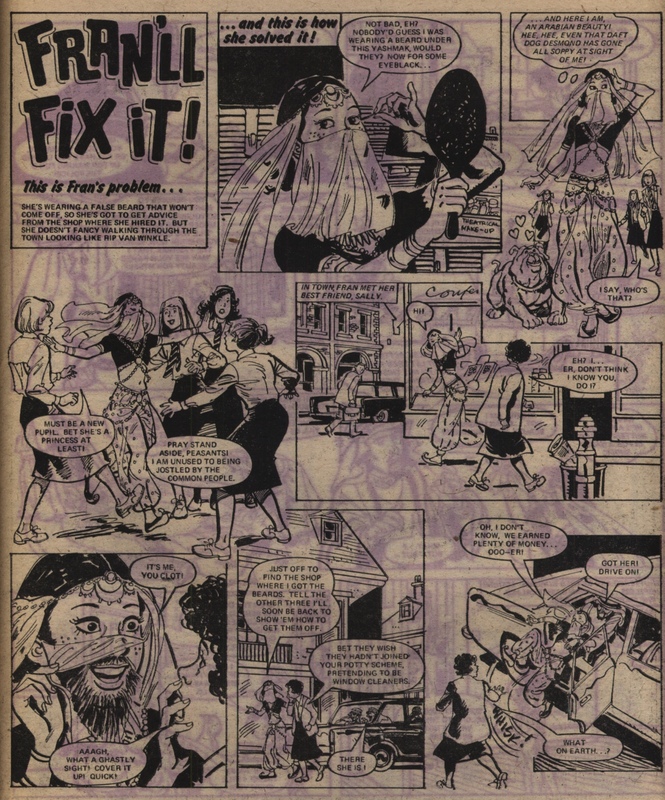 Instead, it tells you that there is a pin-up of the Bay City Rollers waiting for you if you buy the first issue. And Jinty has a new competition where the prize is a cuckoo clock. Unscramble the names of some birds and you go into a draw to win. Katie is helping her Aunt Lucy out at her small hotel while on holiday. Oh, dear – we all know what help from Katie the Jinx can turn into! Tricia finds her blinded cousin Diana is following her around and thinks she’s being haunted by guilt. More likely she’s being haunted by something more fishy. Diana seems to have learned to walk around town blind in a remarkably short length of time. And how does she always know where to find Tricia if she’s blind? Merry gets her memory back in the most shocking way possible – she sees her wanted poster, which tells everyone she’s on the run from a reformatory! Now she remembers, how long can she hide it from the family who are looking after her, especially as they now want to adopt her? There is more parrot trouble than usual with this issue, because Ma Siddons is lumbered with a parrot at the hotel this week. He’s given her husband a good nip on the nose and loves a good nip himself – of rum! And in “Bet Gets the Bird!”, Rosy Posy needs a pick-me-up, but Bet can’t figure out what. And it isn’t rum. “Face the Music, Flo!” starts this week. It has a twist on the theme where the protagonist wants to pursue a dream, but the parent does not want them to because either they got burned by something similar or they want to decide the career. Instead of a parent it’s an interfering sister, Flo, who tries to stop her brother Greg pursuing a show-business career because their late father tried the same but it didn’t work out. But Greg’s going ahead all the same. Is Flo right to stop him or will she find out she should have stayed out of it – even if she did promise her late mother she would make sure Greg got a steady job instead of going into show business? Daddy shows his darling that he still has eyes only for her. Maggie collapses but Daddy won’t get a doctor. Lee has to do it. Meanwhile, Cindy’s scored a small triumph over her nasty cousins. But it looks like things are going to get even worse for her next week now they’ve caught her writing a letter to her father. And it begins with Cindy suddenly being absent from school the next day and nobody knows why. Stuck-up Tina is finding out the fix she’s in – her parents aren’t really her parents, because Salina the Sorceress has sent her to a parallel world where she was never born – and where people can do magic! And Salina is just leaving her to it, to boot – clearly to teach her a lesson, because she disapproves of Tina’s ‘conceited and self-centred’ ways. Sue and her magic bag Henrietta weren’t in the last issue, presumably to make room for the special International Velvet pull-out. (Nor was Alley Cat, also returning in this issue.) Sue’s neighbour is boring on about his big game hunting days, and of course Henrietta obliges in making them all too real! This is the first part of a two-parter. In “Somewhere Over the Rainbow”, Dorrie’s little brother Max gradually recovers from his pneumonia. Their kind temporary guardian, Mr Harris, is sending them back to London and the children’s home they escaped from, for their own good – but they give him the slip at the train station and head on their way again. Rose is finding out more about her mysterious past, while at the same time her graceful gymnastics gives us a beautiful cover image. “Clancy on Trial” is reaching its penultimate episode – her kind cousin Sandra, and her uncle and aunt, are looking like they are going to be put on trial for attempted poisoning of Clancy. It turns out that the herbal medicine that Clancy has been glugging contains some dodgy ingredients! Are they innocent or guilty – with an inheritance at stake? In the Human Zoo, Shona’s rescued from the cruel circus owner who is happy to let her nearly drown every night. Her previous owner, the alien girl Tamsha, rescues her with help from a group of like-minded animal activists. It seems wonderful to be free in the wilderness, at first – but then the cold wind begins to blow. Will Shona just be left to die in the cold, even though at least she is free? Katie the Jinx faces the golf match where £25 is at stake and she knows she really does not have the talent to win. Can her klutziness – or sheer dumb luck – help her out? In “Tricia’s Tragedy” Dad’s snooping goes horribly wrong and he ends up in a police cell. To free him, Tricia agrees to throw the Lloyd Trophy swimming match in Diana’s favour. Looks like Diana’s won and her supposedly blind eyes are all full of triumph – but Dad may not be beaten yet. In “Merry at Misery House”, Merry makes another break for freedom. Unfortunately Miss Ball puts on a disguise to intercept her. Merry finds out the hard way that Miss Ball can really pass herself off as a man when she wants to. Cinderella Smith’s getting some edge on her cousins this week, despite all their abuse, and there’s more. She comes across a wedding photograph where the bride’s face is cut out. Hmm, could there be more to her cousins’ attitude than meets the eye? Daddy is shocked to see his darling turning up at the sale she was going to open looking a fright! He did not count on her helping out in an emergency on the way. In “Face the Music, Flo!”, Greg has walked out on Flo. From the looks of things, he is playing right into the hands of his nasty-looking manager, who clearly wants to drive a wedge between the twins. Flo isn’t giving up that easily of course. However, we do not expect the road to be smooth, especially with Greg in the clutches of that manager. Prissy shows how cruel she can really be when she’s out for revenge – she’s trying to poison Rosy Posy the parrot! Something really needs to be done about Prissy, and Bet is out to do it. Ma Siddons is undercutting the dogs’ food because she spent all her money on a tiara. But after the hijinks of the week she ends up being tricked into feeding them properly.